A couple of weeks ago when I was making Tonga Toast, I had the toughest time finding a loaf of bread. More specifically, I couldn’t find an unsliced loaf of bread. It probably had something to do with going in the middle of the afternoon but hey, not everyone is a morning person. Fortunately, I was lucky enough to find a bakery that was willing to bake me a fresh loaf, at 5:00 PM no less. Now that’s service. But if I hadn’t come across that bakery, what was I to do? Well, I decided I was going to try and make my own loaf so I wouldn’t find myself in that situation again. Guess what? It really wasn’t that hard. 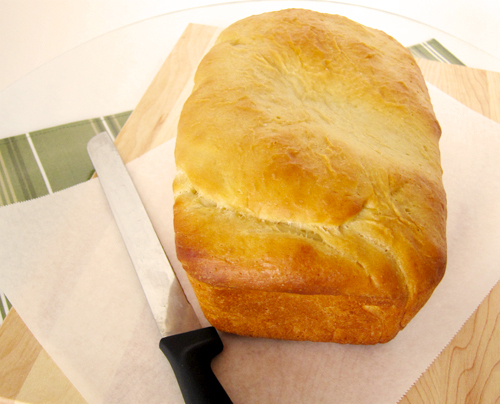 The end result was a warm loaf of bread with a buttery crust and soft white creamy slices. You know the kind of bread that just melts in your mouth. Yum! This bread is so good, you can enjoy a slice of it on its own. But I could definitely go for another helping of Tonga Toast. Or another favorite of mine is to put a slice into the toaster oven with a smackrel of condensed milk. Pure heaven! The best part is, it’s unsliced so I can do whatever I want with it. What are some of your favorite things to do with bread? Combine the milk with the hot water to create a lukewarm liquid combination. In a bowl, combine the milk, water, sugar, yeast, salt, butter and flour and stir until the ingredients are combined and the dough starts to leave the sides of the bowl. Transfer the dough to a lightly oiled surface or use a silicone baking mat and knead the dough for about 6 to 8 minutes. If you have a stand mixer and a dough hook, you could also use that instead of kneading the dough by hand. The consistency of the dough should be nice and elastic and not overly stiff or soft. Place the dough into a lightly greased bowl, cover the bowl and allow the dough to rise. This should take about 60 minutes depending on the temperature of your work space. Dough may not double in size but will be quite puffy. To shape the dough, remove it from the bowl and place it on a lightly oiled work surface or on your pastry mat. Gently deflate the dough and shape it into a 9″ log. Deflating simply means to gently squish the dough and to knead it again so that it is smaller. Place the log into a lightly greased 9″ x 5″ loaf pan and allow the bread to rise until it’s domed about 1″ higher than the top of the pan. This should take about 60 minutes. Start to preheat your oven toward the end of the 60 minutes. Bake the bread in a preheated 350F oven for 20 minutes. Remove the pan at the end of that time and tent the pan with aluminum foil. This is to prevent the top from browning too much. Place the pan back into the oven and bake for another 15 to 20 minutes until the loaf is golden brown. 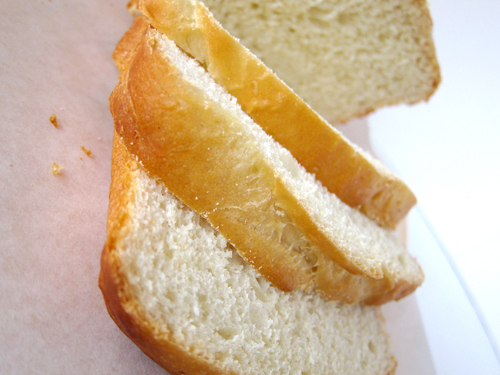 An instant read thermometer inserted into the middle of the loaf will read 195F – 200F. 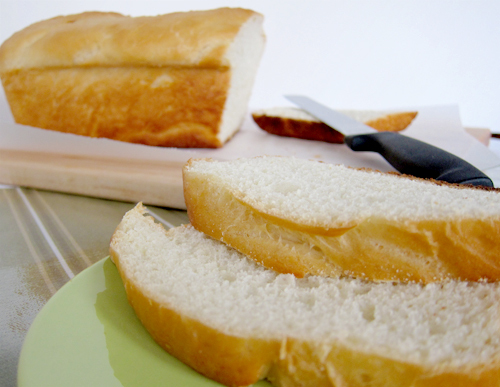 Remove the bread from the oven and from the pan and allow it to cool on a wire rack before slicing. The bread can be stored at room temperature for a few days in a plastic bag.